This is our kind of day ... and month! 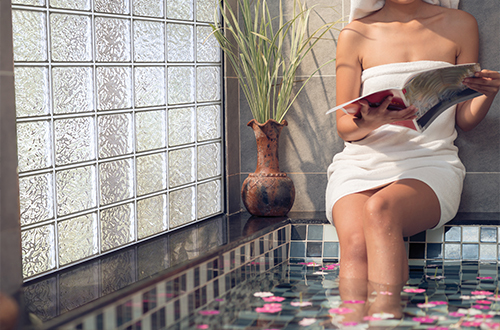 Today is International Bath Day and all month long we're celebrating National Bathroom Reading Month. With all this attention on the bathroom, it's natural that people would savor their privacy. After all, who wants to splash in a tub or read in the bathroom with a window that showcases your activities to the neighbors! Whether you're relaxing in a tub today or reading a magazine in your bathroom, we invite you to consider how much more enjoyable the experience would be if you had guaranteed privacy in your bathroom. Hy-Lite can make that happen for you. Our selection of acrylic block and decorative glass windows brings natural light into the bathroom while keeping your private time, well -- private. You gain a designer window that complements your style of living and at the same time protect your privacy. Enjoy your bath today ... and then tomorrow, go to our webstore to see all the incredible privacy window options available to you.